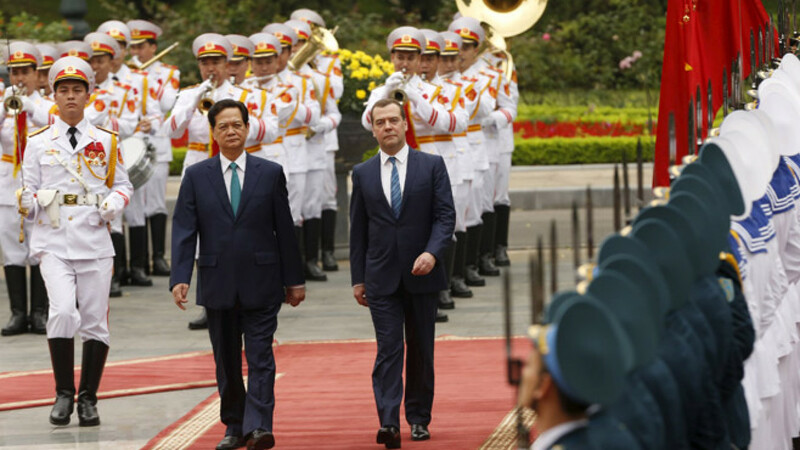 Prime Minister Dmitry Medvedev reviews the guard of honor with his Vietnamese counterpart Nguyen Tan Dung during a welcoming ceremony at the Presidential Palace in Hanoi Apr. 6. Prime Minister Dmitry Medvedev this week traveled to Thailand and Vietnam to deepen Russia's economic ties with Asia amid a breakdown in relations with the West over the Ukraine crisis. With bilateral trade still weak and no major breakthrough during the four-day visit, Medvedev's chief achievement was to show that Russia is serious about working not just with China, the rising regional superpower, but with countries across Southeast Asia, experts said. 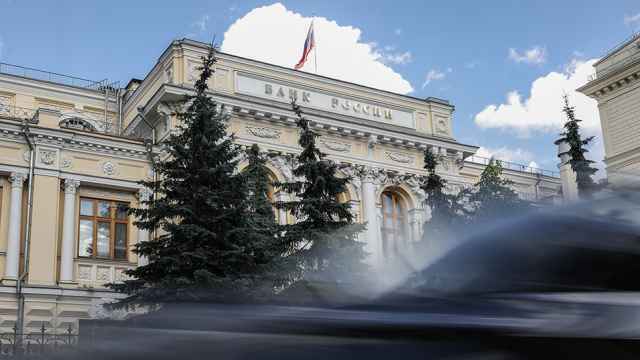 Asian economies have stayed aloof from the diplomatic row over Russia's annexation of Crimea from Ukraine and support for Ukrainian separatists. 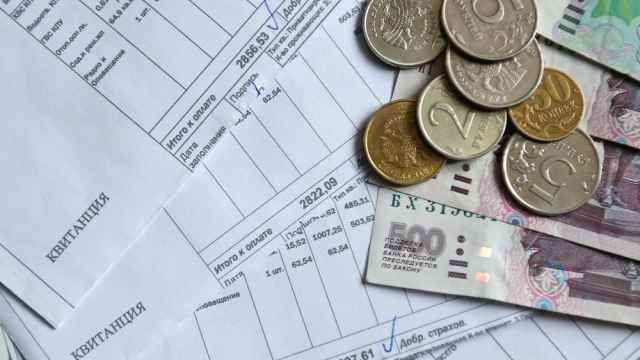 As that conflict spilled over into mutual economic sanctions that are strangling Russia's economy, Moscow has looked east for a lifeline. Medvedev's trip was a statement that "for Russia, Asia is not just China," said Fyodor Lukyanov, editor-in-chief of the journal Russia in Global Affairs. Medvedev's biggest announcement from Vietnam, a close Cold War ally neglected by Russia since the collapse of the Soviet Union, was that a long-debated free trade agreement between the two countries would be signed later this year. The agreement, once finalized, would be a coup for Russia as it would provide a stepping stone to reaching an accord with the Association of Southeast Asian Nations (ASEAN), a liberalized trade regime uniting the region's biggest countries. Gazprom Neft, the oil arm of Russian state energy giant Gazprom, also agreed to buy a 49 percent stake in Vietnam's only oil processing refinery. A number of smaller memoranda were signed on finance and energy exploration. Medvedev's visit to Thailand, the first by a Russian Prime Minister in 25 years, saw a handful of small successes as well. State rail monopoly Russian Railways signed a memorandum with Thai mining and power company Banpu on an infrastructure project in Indonesia, while Moscow promised to buy at least 80,000 tons of Thai rubber for use the defense industry. Russia also launched talks on unspecified arms sales to Thailand, which hopes to find a favorable market after the West pulled back from the country following a recent military coup in May last year. "Our friends from the Western part of the world are ignoring Thailand," news agency Reuters quoted Russian Trade Minister Denis Manturov as saying Wednesday. Still, Medvedev was unable to clinch a final deal on the free trade agreement. Without any major deals to announce, the visit by Russia's No. 2 politician showed that Moscow is serious about its pivot to the East. The Soviet Union was active in Asia, especially Vietnam, where the Soviets operated a naval base, but after the fall of communism Russia's international presence waned. Moscow has in recent years made efforts to renew ties, but only began pursuing better relations actively after the annexation of Crimea last year put Russia and the West on a collision course. "This is a signal that Russia is starting to overhaul its policy, which until this time was limited by Western-centrism," Lukyanov said. "The [Ukraine] crisis gave the push that was needed." But so far, Russia's eastern overtures have mostly concerned China. Russia last year announced that a deal had finally been cliched after years of negotiations on the Power of Siberia, a 4,000 kilometer gas pipeline to China. 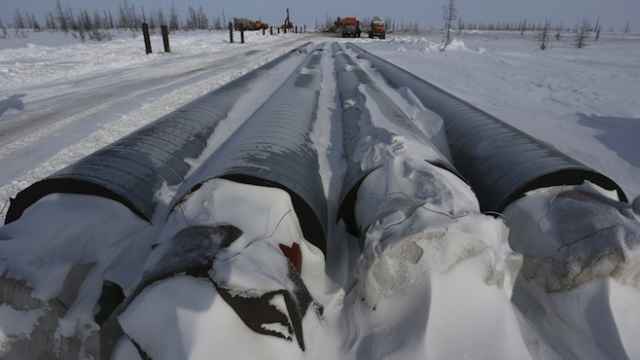 Russia's Gazprom said this month the pipeline would cost 800 billion rubles ($15 billion) to build. The two countries aim to hit $100 billion in trade turnover this year. The visit to Vietnam and Thailand is a signal to China that "it is not the only country that interests [Russia] in the region." said Vladislav Inozemtsev, professor of economics at Moscow's Higher School of Economics. But Mazirin stressed that Russia was not trying to rival Chinese influence. "We in no way want to oppose China in Vietnam's case — this is a common and incorrect belief among Western political scientists," he said. Opposing China in the area would be difficult. Medvedev said during his trip that he hoped Russia and Vietnam could boost trade turnover to $10 billion over the next 5 years and increase trade to $10 billion next year with Thailand. China's trade turnover is set to hit $60 billion this year with Vietnam and $100 billion with Thailand, the China Daily newspaper reported last year. Medvedev's trip was a small step forward for Russia in the region, Mazirin said. "We've never had such close relations with Thailand as with Vietnam, so in some sense this was an achievement."